It's that time of year again, school bells have rung! Yep, you guessed it, this weeks Bloggers Challenge theme is Back to School! Thanks to those who played along with last weeks Texture Challenge, it was wonderful to see so many entries and how you incorporated the challenge into your projects. I don't have a ton of school related images, so instead I reached for some stencils and my favorite children from the Artistic Outpost Think and Wonder plate to create my mixed media card. I started off by spraying Dylusions Spray over the Number Stencil on Watercolor paper, then blotted try. The text is from the ﻿Artistic Outpost Geek is Chic (now retired) set, stamped in Black Archival. I used Blue paint and a stencil to apply to dots. The children were stamped in Black Archival on a leftover piece of the BG, thus the overspray in certain areas. I cut them away from the alpha background and adhered them so their feet just touched the bottom of the stenciled panel. Keeping with the BTS tradition, I did the annual BTS photo session, except this year it was just Joe in the photo. 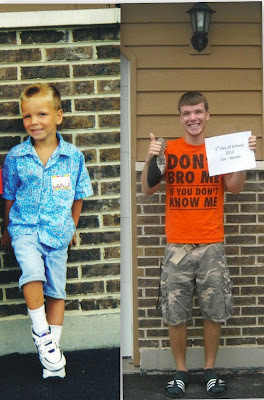 On the left is his first day of Kindergarten, on the right is his first as a Senior. If you'd like to play along with this weeks Bloggers Challenge, please link back to this post on your blog and mention you created your card for the Bloggers Challenge - Back to School. Please add your link using the Link Tool below, your link should be a direct link to your Bloggers Challenge Post, use your name as the Title. Please do not link to cards that were created prior to the challenge date. Entries not linking properly, or backlinked will be removed. If you have the captcha enabled on your blog, please consider turning it off, as it makes it so much easier to leave comments. Fabulous, Lisa--both the card and the photos of your son! He sure is all grown up ! Love your card, the bg is just too cool. That stencil is the perfect background for this one. Love those pics! Cool card Lisa, I like the image and the backgroud and that sentiment is awesome. Wow your son has really grown. I'll be taking Coleen's Back to School photo on Sept. 2 when she heads off to start 2nd grade. I am loving the backgrounds you are creating!! Fabulous colors and cute image/sentiment for the theme. Really cool card - background is fabulous, and it's one of my favourite AO stamps - saving up for it! Thanks for that wonderful inspiration! Glad to join in the hop! Love the funky feel to your card! Great sentiment too! Great inspiration! I love back to school time...great challenge! love the card and all the projects! great theme!! Love the colors in the background! Beautiful card! Joe's picture of him as a youngster is too cute and he is all grown up and handsome now.